It’s hard to believe that summer’s over already, and my even though it’s October, we’re still trying to get into our routine–waking up early, packing lunches, remembering to pack PE clothes, and all the other details that we get to forget about during the summer. We struggle with keeping my daughter’s room tidy–she’s thirteen, so I think that’s a common complaint! She’s fortunate enough to have two closets and a dresser to hold her clothes, and she prefers to fold most of them and put them in the dresser. As long as she puts her clean laundry away and keeps the few items that wrinkle easily hung up, I’m fine with that. 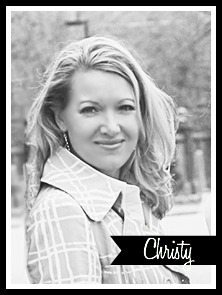 We’ve come up with a few organization ideas that help keep clutter corralled in her room; they’re all easily and relatively inexpensive. 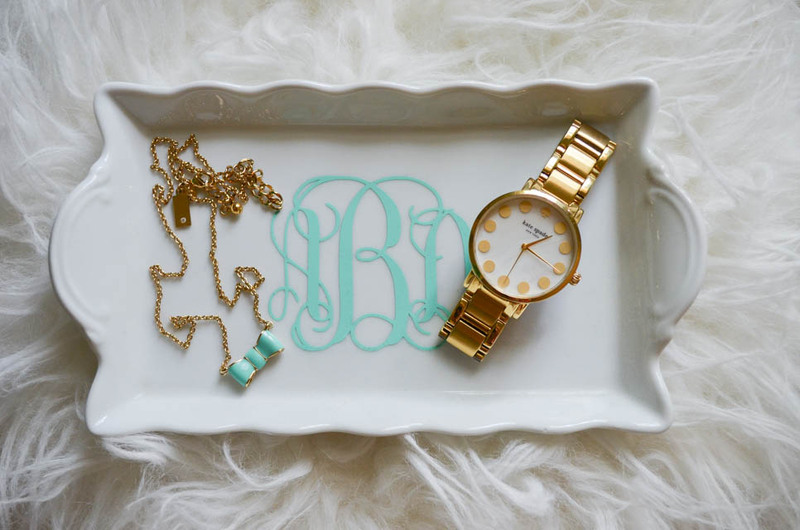 First, a pretty tray that I found at the thrift shop holds the jewelry that she wears every day. I added the monogram using my vinyl cutter. Bins and bags work well for smaller items–socks, leotards, swim suits, gym shorts, etc. They get hidden away and are easy to grab in the morning. The shoe cubby at the bottom of the closet is a life saver; shoes are easy to find but not piled up on the floor. 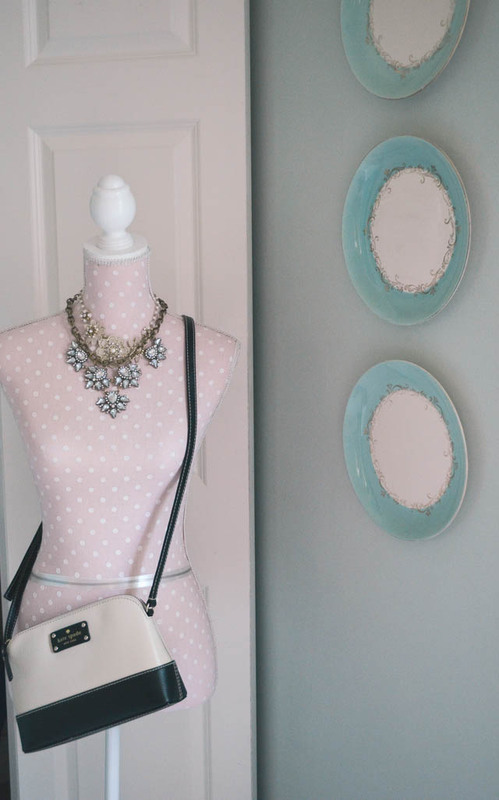 The mannequin is a fun decorative touch, but it’s also functional. 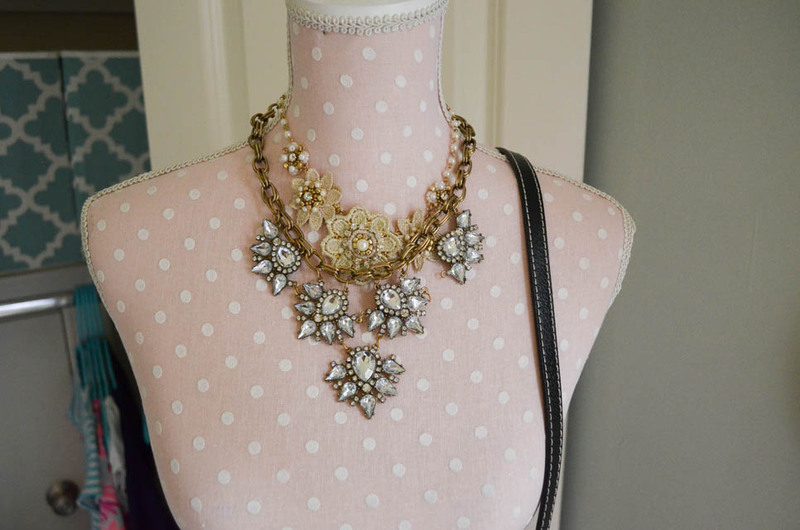 My daughter displays her necklaces and scarves on it, and she’s even been known to use it to try out a new outfit. Sometimes her jewelry lives in the closet, and sometimes it’s out on her dresser. 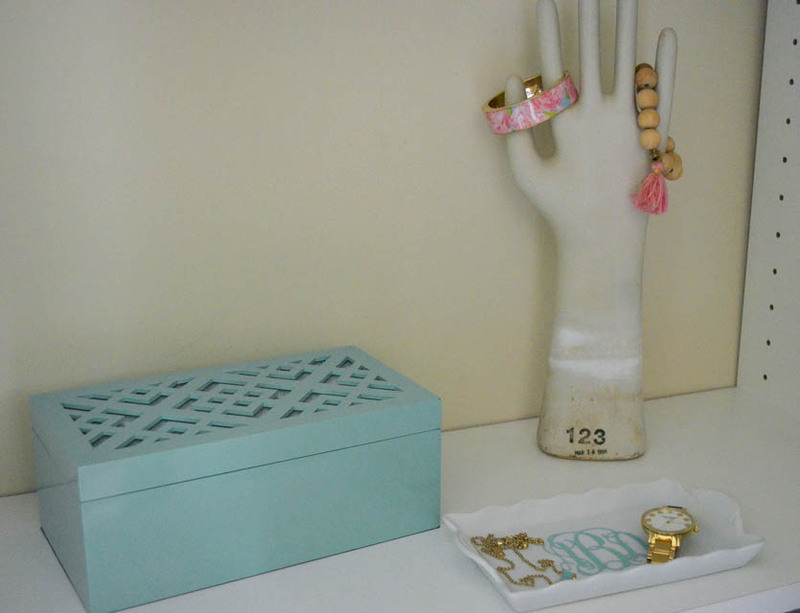 Either way, a pretty jewelry box and a fun vintage glove mold are good ways to organize, display, or conceal her small collection. 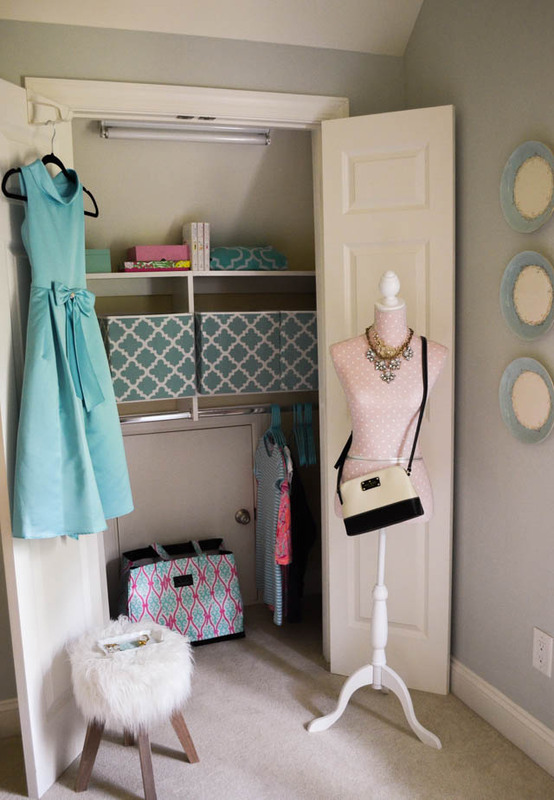 If you have a small closet, be sure you’re utilizing all of your space. 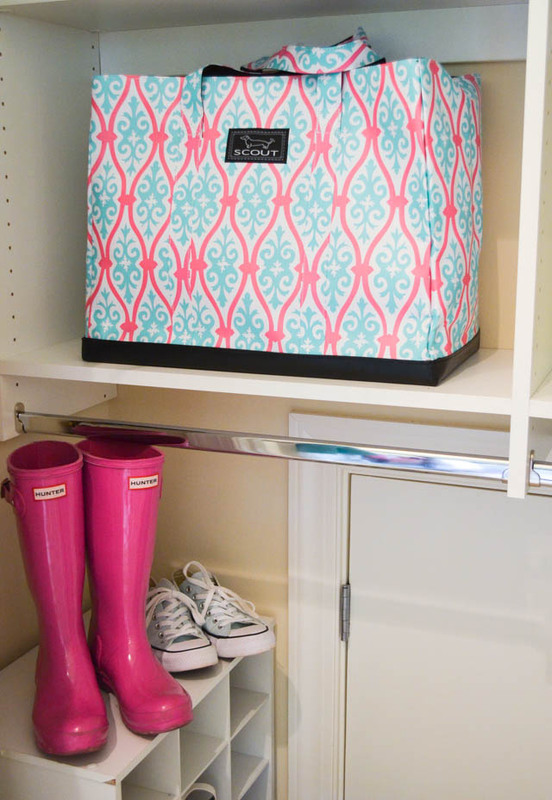 An over-the-door hook allows you to hang longer items or air out clothes. And I always try to keep my kids’ laundry baskets in their closets so dirty clothes are tossed out of sight instead of randomly on the floor. Of course, these are teenagers we’re talking about, so the clothes don’t always hit the laundry basket! Our posts contain affiliate links. If you make a purchase after clicking on these links, we will earn a small commission, which helps to keep our content free. You don’t pay a cent more than you would otherwise, since that would be tacky! Read our full disclosure policy here. I love the wall color in your daughter’s room. Do you happen to have the name of the manufacturer and the color/number?